Not a review but a shout out for what looks to be an interesting premise for a book. How many of us have looked at our friends kids as potential mates for our own children? 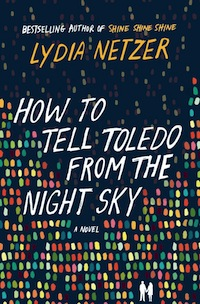 HOW TO TELL TOLEDO FROM THE NIGHT SKY is a mind-bending, heart-shattering love story for dreamers and pragmatists alike, exploring the conflicts of fate and determinism, and asking how much of life is under our control and what is pre-ordained in the stars. Beyond the skyline of Toledo stands the Toledo Institute of Astronomy, the nation's premier center of astronomical discovery and a beacon of scientific learning for astronomers far and wide. One of these is George Dermont, a dreamer and a man of deep faith, who's trying to prove the scientific existence of a Gateway to God, and speaks to ancient gods and believes they speak back. Its newest star is Irene Sparks, a pragmatist and mathematician invited to lead the Institute's work on a massive superconductor being constructed below Toledo. This would be a scientist's dream come true, but it's particularly poignant for Irene who has been in self-imposed exile from Toledo and her estranged alcoholic mother, Bernice. When Bernice dies unexpectedly, Irene resolves to return to Toledo, and sets in motion a series of events which place George and Irene on a collision course with love, destiny, and fate. You see, George and Irene were born to be together. Literally. Their mothers, friends since childhood, hatched a plan to get pregnant together, raise the children together and then separate them so as to become each other's soulmates as adults. Can true love exist if engineered from birth?